A series of hat insignia were worn by officers. The four types pictured above are the more common ones that will be encountered. Less common are the ones worn by members of the various staff departments, such as engineers and ordnance officers. The larger size insignia are for the front of the Jeff Davis hat and the smaller size ones are for the front of the forage cap (kepi). 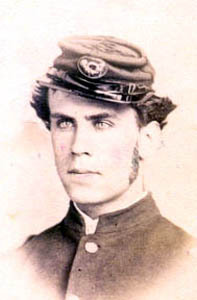 During the Civil War it was unusual for enlisted men to wear branch insignia on the front of forage caps. A Civil War soldier wearing a branch insignia on the front of a kepi in a photo will almost always be an officer. During the postwar period the size of branch insignia were reduced and enlisted men began to wear them on the front of forage caps rather than the top. The numeral "one" within the above infantry horn indicates a regiment, having the number one. It is not possible to know from an actual insignia or photograph whether or not the regimental number is that of a regiment from particular state or from the Regular Army of the United States. Some insignia have numbers in bullion embroidery or as small silver numbers added to the insignia. In other cases (as shown) the insignia were worn without any regimental number. The insignia themselves were generally made from bullion embroidery, but also were sometimes stamped brass with a false embroidery surface. The U.S. wreath was worn by general officers and also certain staff officers, commonly surgeons and paymasters. Chaplains also wore staff wreaths. Other uniform features distinguished the grade and branch of service for these officers.